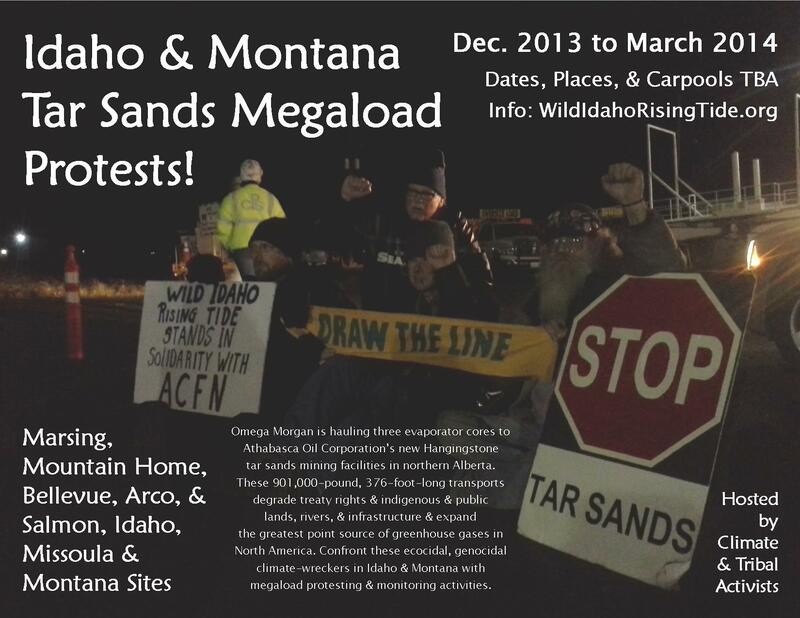 Missoula Megaload Protest on Thursday Night! On Wednesday night, March 12-13, the third Omega Morgan transport originating at the Port of Umatilla, Oregon, and carrying Alberta tar sands mining equipment traveled from Darby to Lolo, Montana, and will traverse Missoula on Thursday night, March 13-14, after midnight. Indian Peoples Action (IPA), Blue Skies Campaign, Northern Rockies Rising Tide, and other Rising Tide groups and allies are again organizing and supporting round dances in the middle of Reserve Street, to temporarily block this megaload and share opposition to tar sands development with the world. As we await an official media release and action alert (posted as soon as possible from the road), IPA is calling on all Natives and allies in Missoula and beyond to join in this respectful, non-violent protest with no intentions of arrests. Action organizers are bringing independent media to ensure wide coverage, and are hoping to double participation from about 70 people at the previous Missoula megaload protest on January 23. Contact Wild Idaho Rising Tide (WIRT) at 208-301-8039 for 12:30 pm Moscow, Idaho, carpools, and Terry Hill of Spokane Rising Tide at Facebook.com/Terry.Hill.509 for 3:00 pm Spokane, Washington, carpools to Missoula on Thursday afternoon, March 13. Montana activists have arranged lodging for participants visiting Missoula. Plan to meet for this great indigenous-led event at the Rosauers parking lot at 2350 South Reserve in Missoula, at 12 midnight on Thursday/Friday, March 13-14. If you have any questions, please email Kathy Little Leaf at peiganndn@gmail.com or indianpeoplesaction@gmail.com or see the Indian Peoples Action facebook page at Facebook.com/IndianPeoplesAction for more information. Based on the ever-changing schedule of transports in transit, WIRT will regularly update the tentative dates, times, places, and carpool arrangements of other Montana protesting and monitoring activities at various locations as they arise, on the WIRT website and facebook pages. Idle No More! In response to the Idaho Transportation Department’s (ITD) atypical early warning on Friday, February 14, that an Omega Morgan tar sands megaload would cross into Idaho during the ensuing, usual dearth of weekend media information, Wild Idaho Rising Tide (WIRT) reluctantly composed a call-to-action for southern Idaho on February 16 . We remembered the last time that WIRT proclaimed that this could be the “last chance” to protest megaloads on a certain route, in that last case, Highway 12, as the first Omega Morgan shipments rolled in October and December 2012. WIRT and allies assumed that Idaho Rivers United would win their federal court case during the following February, which they did. But Omega Morgan nonetheless tried to access Highway 12 again in August 2013, and the world knows what happened next. Of the eight to ten loads that the hauling company originally proposed for Highway 12 since last summer, one entire load crossed Highway 12, another traversed Highway 95 in five parts during October and November 2013, and three core pieces have launched from Oregon. WIRT is wondering where the other three to five Omega Morgan shipments went. Do the three latest transports really signal the conclusion of eastern Oregon/southern Idaho route use, or will tar sands infrastructure haulers keep coming, not to mention through the Highway 95 sacrifice zone? Although we understand the difficulty in turning from the dead-end, destructive, fossil-fuel path that currently careens the world into climate chaos, we are amazed at how much money corporations keep investing in these ridiculous megaload maneuvers, as activists work to correct their course. WIRT received news on Monday, February 17, that the third Omega Morgan tar sands megaload originating at the Port of Umatilla was still in Oregon . We suspected that our press release on the previous day nudged the regional media into keeping citizens informed about this issue. But during its emergence from a media blackout, the transport left John Day and traveled during daylight hours, to avoid possible night-time ice and fog over Eldorado Pass. As during Oregon passage of the first two Omega Morgan megaloads, the Oregon Department of Transportation (ODOT) again allowed the heavy hauler to change its permit and thus compromise the safety and convenience of daytime travelers without advance notice . To accommodate Big Oil profits, state governments apparently work for the corporations or higher government, not the people. WIRT and allies once more encouraged Oregonians to call or email ODOT director Matthew Garrett in politely forceful protest of this policy, based on information provided by All Against the Haul, a partner group that has mobilized Montanans and helped Act on Climate initiate the Oregon lawsuit against megaloads . Round 3: Idaho & Montana Tar Sands Megaload Protests! Wild Idaho Rising Tide (WIRT), 350 Boise, and Occupy Boise are again organizing megaload protesting and monitoring activities at Marsing, Mountain Home, Timmerman Junction, Arco, and Salmon, Idaho, and supporting blockades organized by Indian Peoples Action, Blue Skies Campaign, and Northern Rockies Rising Tide in Missoula and other Montana locations [1, 2]. Based on the ever-changing schedule of transports in transit, WIRT will regularly update the tentative dates, times, places, and carpool arrangements of these events on the WIRT website and facebook pages. Please bring your family, friends, and neighbors, and come prepared with protest signs, banners, and equipment, musical instruments, voices, and chants, audio and video recorders, cameras, notepads, and your spirit of solidarity, regional resistance, and freedom of expression. * Boise carpools to Marsing and Mountain Home: Contact Ann Ford of 350 Boise at annkeenan4d@gmail.com or 208-344-4675. Meet at the Shopko sign/parking lot at 2655 South Broadway Avenue, at 8 pm MST on Thursday, February 20, for Marsing carpools, and at 9 pm MST on Friday, February 21, for Mountain Home carpools. * Marsing protest: Also meet at the Marsing Elementary/Middle School parking lot, 205 Eighth Avenue West, Highway 78, at 9 pm on Thursday, February 20. * Mountain Home protest: Also meet at the Pilot Travel Center, 1050 Highway 20 at Interstate 84 Exit 95, at 10 pm MST on Friday, February 21. * Wood River Valley/Timmerman Junction protest: Meet to carpool in the Atkinsons Market parking lot, 757 North Main Street in Bellevue, at 9 pm MST on Saturday, February 22, or at the Timmerman Junction rest area, on the southwest corner of the U.S. Highway 20 and Idaho Highway 75 intersection, at 10 pm MST on Saturday, February 22. * Pocatello/Blackfoot area carpools to Arco: Contact Levi Shoemaker at Facebook.com/Levi.Shoemaker2. Meet at the Big Kmart sign/parking lot at 3945 Pole Line Road in Pocatello, at 8 pm MST on Saturday, February 22. * Salmon protest: Meet at the Skate Park in Island Park, at 10 pm MST on Thursday, March 6. * Missoula protest: Meet at the Rosauers parking lot at 2350 South Reserve in Missoula, at 12 midnight on Thursday/Friday, March 13-14. * Spokane, Washington, and Moscow, Idaho, carpools to Missoula and Montana actions on Thursday, March 13: Contact Terry Hill of Spokane Rising Tide at Facebook.com/Terry.Hill.509. Montana activists have arranged lodging for participants visiting Missoula. * Megaload monitoring at various locations: Contact WIRT at 208-301-8039 and wild.idaho.rising.tide@gmail.com. * Contributions for organizer, monitor, and protester travel and potential legal expenses: Donate through WePay at WePay.com/Donations/907347297 and via mail to P.O. Box 9817, Moscow, ID 83843. Oregon Megaload Rally TONIGHT (Tuesday)! WEDNESDAY UPDATE: Umatilla tribal members monitoring megaloads tonight (Wednesday) between Pilot Rock and likely Ukiah, Oregon, need our on-site solidarity and cooperative work, for their safety constantly compromised by cops. 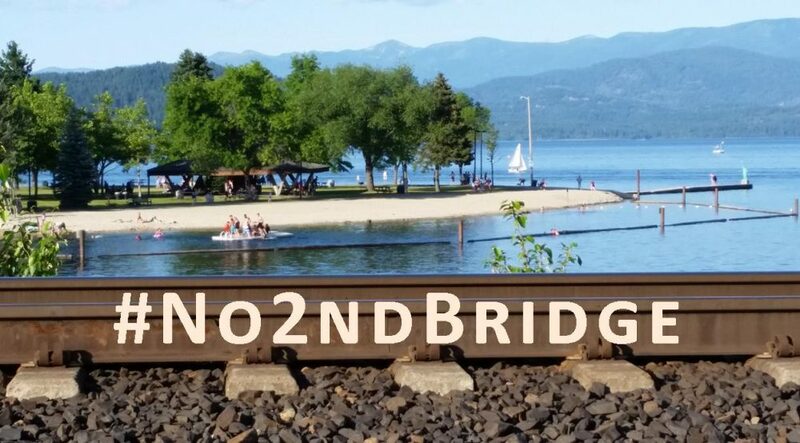 See the monitoring notes about the Tuesday night megaload movement on the Wild Idaho Rising Tide and Portland Rising Tide facebook pages and below. The Oregon Department of Transportation permitted movement of the third Oregon megaload last week, just before a major regional snowstorm brought blizzard conditions up the Columbia Basin and snow to Lewiston area ports. 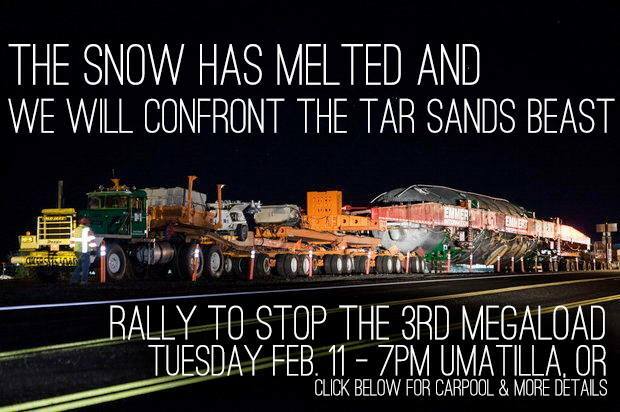 But as the snow melts, Portland Rising Tide and allies expect the Omega Morgan-hauled tar sands transport to move tonight, Tuesday, February 11. They are hosting an anti-megaload rally at the Port of Umatilla, likely the last public opportunity in eastern Oregon to show tar sands profiteers that tribal and climate activists and Oregon citizens will not let them transform indigenous Umatilla homelands into a long-term, heavy haul route for dirty energy extraction equipment used to destroy the Earth and climate. On Tuesday, February 11, 2014, Peo Peo Mox Mox Chief Yellowbird and Headman of the Walla Walla Tribe, Carl Sampson, and Peter Goodman, representing Act On Climate, filed a lawsuit in Marion County Circuit Court, a day after dozens of supporters gathered outside. Their case requests a court review of a permit issued by the Oregon Department of Transportation (ODOT) for Omega Morgan to haul a third tar sands mining equipment megaload on eastern Oregon scenic highways passing through tribal lands. On Thursday, February 6, 2014, climate justice activist Cathy Sampson-Kruse and her attorney, Lauren Regan of the Civil Liberties Defense Center (CLDC), successfully resolved her Umatilla County Circuit Court case regarding her act of nonviolent civil disobedience that attempted to stop an Omega Morgan transport of megaload equipment, on its way to Alberta tar sands mining operations on December 2, 2013. 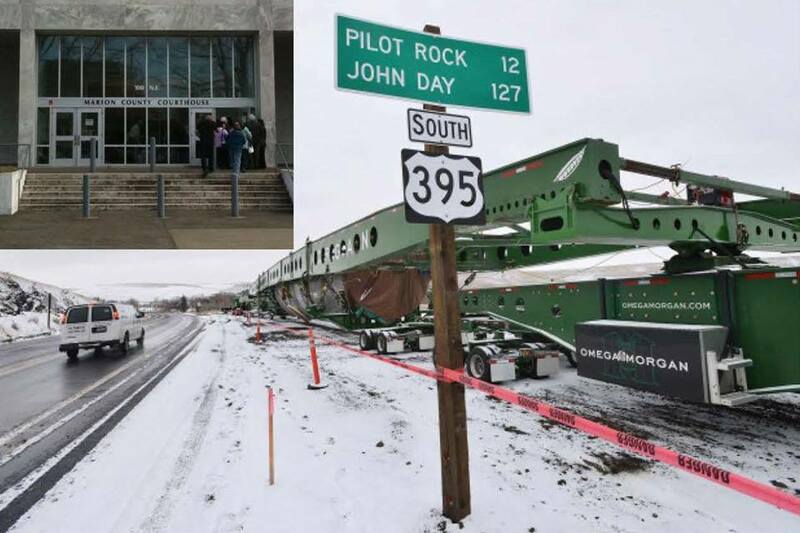 * Police arrested Cathy while she put her body upon the roadway, causing the obscenely large equipment to temporarily halt its path of destruction. Ms. Sampson-Kruse, a Native American elder, grandmother, mother, and the daughter of Chief Yellowbird of the Walla Walla Tribe, has inspired her community and the climate justice movement. After county sheriffs roughly arrested her and attempted to degrade her spirit, she was charged with disorderly conduct and the legally meritless charge of interfering with police. On Thursday, Umatilla County Circuit Court followed the recommendation that she complete 20 hours of community service in exchange for a lesser violation conviction of disorderly conduct and dropped charges of interfering with police. Ms. Sampson-Kruse and her attorney, Lauren Regan, are both pleased with this outcome. Climate and tribal activists offer Cathy their gratitude, respect, and love, honoring her and all of the courageous regional protesters now and in the future, who prayed, sang, drummed, wrote, called, and supported Cathy’s and the movement’s shared spirit of megaload and tar sands resistance. For more information or to donate to CLDC in Eugene, Oregon, please see the CLDC.org website or contact info@cldc.org or donate@cldc.org.